We are very pleased to announce that BDSwiss’ Grand Forex Affiliate Competition was completed with great success. The competition started on December 1st, 2018 and was completed on January 7th, 2019. 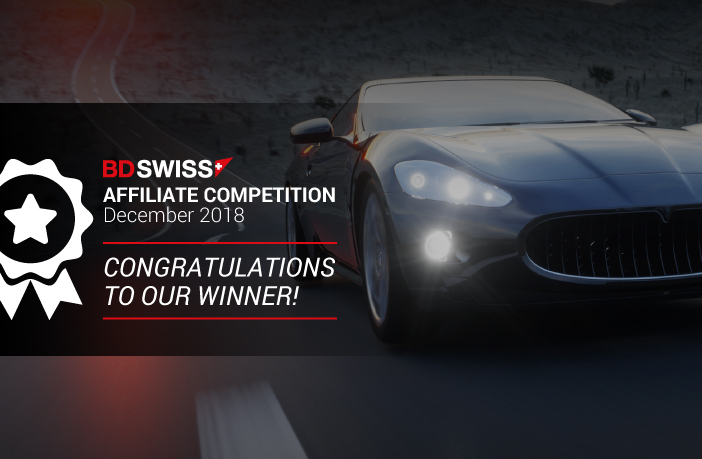 The contest was based on trading volume performance and BDSwiss Affiliate partners, had the opportunity to compete and claim the Top Prize which was a selection between a once-in-a-lifetime experience to drive their dream sports car for a week, an all-expenses paid trip to Cyprus or an equivalent cash prize of £7,000. We are admittedly very pleased with the participation and the performance of our online forex affiliates. December is usually a low performing month due to the holidays season, but in our case, we witnessed a record month, with great trading volume. We would also like to announce that, results have been verified and our grand winner has already been notified. Coming from Germany, but focusing on global traffic, the competition winner is now in the process of selecting his award. Our highest ranking affiliate has managed to climb to the top of our leaderboard by achieving an astonishing trading volume. It was an undeniably well-deserved victory! We would like to thank all affiliates who took part in our Dec 2018 contest. We’ve seen some very high volumes and we hope that they have enjoyed healthy revenue streams. Our online and offline partners can expect more added rewards and forex affiliate competitions in 2019. At BDSwiss, we offer our partners a complete 360° solution, enabling them to truly maximise their potential. We listen to our partners and try to bring value and establish long-term relationships. Apart from the timely payments and competitive plans, we offer our forex partners and affiliates a highly personalised solution and some of the highest conversion rates in the market. Having a customer-centric approach, we further make sure our partners’ clients have everything they need product-wise, to do this, we constantly upgrade our offering with new FX / CFD tradable assets, investment options and trading platforms. Explore the opportunities of partnering with a leading broker by visiting our forex Partners’ Portal . Alternatively, you may choose to complete our Affiliate Registration form directly. One of our Business Developers will contact you at a time of your convenience to strategise and create your own customised remuneration plan.